Member for Vanimo Green, Belden Namah,has been dismissed from Office after a Leadership Tribunal found him guilty of seven counts of Misconduct in Office. The Leadership Tribunal finally handed down its verdict this morning at 11.30am. The proceedings were concluded about 5 months ago in which the MP for Vanimo Green River was alleged to have breached the leadership code. 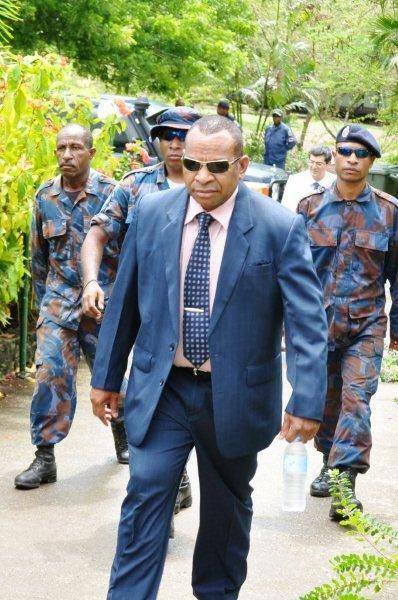 The leadership tribunal set up trialed the MP for Vanimo Green River for 13 counts of leadership misconduct. In the decision handed down this morning Namah was found guilty of 7 of the counts including storming out of the court room in 2011 at the height of the 2011 political impasse. During the impasse it was alleged that he stormed the courtroom while it was in session and ordered the soldiers and policemen with him to arrest the Chief Justice Sir Salamo Injia. Meanwhile, the lawyer representing Belden Namah Greg Sheppard is studying the decision and will consider the options to stay the ruling of the tribunal whilst also seeking a judicial review in the Supreme Court for relief for the MP for Vanimo Green River. He said there were very good grounds to seek a review of the tribunal’s decision to impose the maximum penalty of dismissal from office for Belden Namah.